Saqra is an award-winning dancer in Seattle, Washington who has contributed many valuable articles to this web site. How to Get the Most out of Practice Time. Tips for organizing your practice time for best results. Wearing Coin Scarves to Workshops. Insight on when you should, when you shouldn't, and why. No Need to be Afraid of Private Lessons. Saqra offers a belly dance tip on how to take the fear out of private lessons through preparation. Keep Asking. Why some moves seem especially difficult to master, and offers tips on what to do about it. Learning Choreography. Easy-to-use tips for learning a choreography. Connector (Transition) Steps for Belly Dance Improvisation. One of the techniques you can use to learn how to dance freestyle, without choreography. How to Get Your Money's Worth from a Choreography Workshop. How to make use of what you learned, even if you don't plan to perform it. Horrible Workshops. No matter how disappointed you are by a workshop, it's possible to gain something of value. Here's how. Drum Solo Builds. How to build the energy in a drum solo. Holding Accents. After the accent, then what? Belly Dancing to Fast Drum Solos. Musical interpretation for drum solos, by Saqra. Different Musical Sections, Different Moods. Advice on choosing music to showcase your range of dance skills. Preparing Performance Music. Tips for editing music for your performances. Performing to Alternative Music. Insight into how to create a compelling performance to non-Middle-Eastern music. Exploring Undulations. How to create an endless variety of undulations in your dance. Belly Dance Spins Without Vomiting. Several tips for taming nausea when spinning. Belly Dance Tips for Arms. Tips for graceful arm technique, costuming, and posing. Drum Solo Accent Chains. How to build sequences of accents that make sense together. Pop, Drop, & Lock Technique in Drum Solos. How to use accents in ways that enhance your dance. Dance Technique for Lovely Hands. How to hold your hands attractively when you dance. How to Improvise in Floor Work. Use this simple format to make your dance flow beautifully. Using Your Hair to Extend Movements. How to use your hair, real or imagined, to bring extra life into your dance movements. Becoming the Best Belly Dance Performer You Can Be: Part 2, Technical Skill. Checklist to help you become a better performer through assessing your technical dance skills. 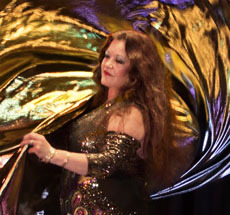 Lighting for Your Belly Dance Photos and Videos. By Saqra. Preserve your dance memories by avoiding common pitfalls in using your camera. Choosing Costume & Acts Appropriate to the Situation. By Saqra. How to be welcome at events and increase your popularity with audiences. The 70% Rule. How to use restraint to keep your audience captivated, by Saqra. Continuity of Movement. Use "glowing green goo" to lead your audience's eyes through your dance. Handling Bloopers. What to do next if an embarrassing blooper happens. Facial Expressions for Performers. How to maintain appropriate facial expressions when performing. Entrances, Song Transitions, and Stage Presence. Make the connection with your audience and your music. Adrenaline Effects on Belly Dance Performance. How your body's chemistry affects your dancing. Easing Stage Fright. Technique to feel more comfortable with your audience. Simple Calming Technique. Useful for not only stage fright, but also other stressful situations. Go to the Light! How to be aware of lighting when you perform and use it to your advantage. Appearance Anxiety in Belly Dance Performance. By Saqra. Why your performance helps other people. Making Your Prop Dancing Memorable. How to make your prop performances more exciting and compelling for the audience. Live Music Will Not Kill You. How to partner with live musicians to create a show you can ALL be happy with! Becoming the Best Belly Dance Performer You Can Be: Part 3, Entertainment Ability. Checklist to help you become a better performer through assessing your abiity to entertain people. Becoming the Best Belly Dance Performer You Can Be: Part 4, Content of Your Routine. Checklist to help you become a better performer through assessing how your dance routine fits together. 3 Basic Tips for Choosing Music for Your Performance. Tips for working with your collection of belly dance music and choosing which to use for performances. Color Levels: Teeth and Skin. How far should you go in bleaching your teeth or tanning your skin? Hygiene vs Dance Opportunities. Public service announcement to avoid losing gigs. Are You Sure Your Costume Isn't See-Through? (You Might Be Surprised!) A word to the wise. About Persian Lace. Saqra provides background information about this fabric used in many belly dance costumes in the 1970's and 1980's. 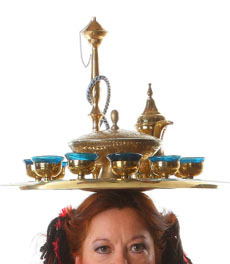 Belly Dance Makeup to Go With Your Costume. Things to consider when choosing makeup colors and deciding how much to apply. Belly Dance Costume Checklist. Points to consider when deciding which costumes to buy, or which to use for upcoming shows. Cheap Costume Jewelry for Belly Dancing. Some tips for using it. Why Wear a Cover-up at a Show? Saqra explains why it's important. Tips for Tall Belly Dancers. Props, posture, costuming, and more. Four Stage Makeup Tips for Older Belly Dancers. Suggestions for applying stage makeup to camouflage some of the signs of aging. Becoming the Best Belly Dance Performer You Can Be: Part 1, Your Appearance. Checklist to help you become a better performer through assessing your costume and makeup. Finger Cymbals. Saqra explains why it is important for belly dance teachers to introduce finger cymbals to beginners, rather than waiting. Voice Control for Dance Classes. By Saqra. How to use your voice when teaching belly dance classes to create a comfortable classroom experience for all. Keep Asking. What new teachers need to know about helping students learn the moves. Why Many Belly Dance Events Ban Flash Photography. Insight for belly dance event organizers on how improve quality of videos and photos for performers. Advice to Chickens on How to Do Belly Dance Entrances. A playful version of Saqra's dance tip on entrances, written for people who love birds as much as Saqra does!